While everyone knows divorce is tough on kids, researcher and writer Elizabeth Marquardt says even when the split is amicable, kids still suffer. For her controversial new book, "Between Two Worlds: The Inner Lives of Children of Divorce," Marquardt spent three years interviewing 1,500 young adults--half from divorced families--who described the painful emotional, moral and spiritual dilemmas they faced. Marquardt talks with Newsweek's Peg Tyre about the pain children of divorce may be harboring and what parents can do about it. What feelings do children of divorce share? They feel strongly and intensely that their parents are polar opposites, even if they don't fight. They feel they must take care of their parents rather than be taken care of. They feel loss and anger. They also feel their spiritual life is damaged because God's image as a parent is painful for them. Many couples think it's best for the kids if the parents share custody. True? While everyone agrees that losing contact with a child is a tragedy, presuming that joint physical custody is right for everyone is dangerous. Judges and parents need to be flexible and be oriented around the needs of the child--not the parents. Joint custody is, for some families, the best choice--but it's not a solution for everyone. But surely divorcing parents can do something to minimize the impact on their kids? The happy talk is that if both parents stay in touch with the kid and limit conflict, things are going to be OK. 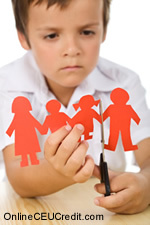 But what my study shows is that divorce divides the inner lives of children even when the parents don't fight. What happens is that the conflict experienced by the parents is simply handed to the child who must then make sense of the two worlds alone. In your book, you write about the pain and confusion surrounding your own parents' divorce. In many ways, the book grew out of my own experiences. Again and again, I ran into the idea that since I was successful and didn't have any outward signs of dysfunction, people assumed I was fine and my parents' divorce wasn't a big deal. That was where the state of debate about divorce was: it left out the experiences of a lot of kids who are surviving a very big challenge. I wish I had this book when my parents were going through their divorce. What do you suggest unhappy couples do? I'm not against divorce, but the best answer might be to get help and stick it out--especially if you are in a low-conflict marriage. The idea that we know how to do divorce better now leads a lot of adults and children down a really painful path. And if you're already in the process? My intention is not to make divorced parents feel crappy. But we should be able to listen to a child's expression even if it hurts. If a parent can help a child feel less isolated and alone, that would help. Marquardt says it sometimes makes sense to stay together for the kids. 52% of adults with amicably divorced parents found life stressful vs. 35% from unhappy but low-conflict unions. 51% say they always felt like adults, even when they were just kids. 30% report feeling like outsiders in their own homes, compared with 17% of young adults from intact families. The preceding section contained information regarding the secret pain of divorce. Write three case study examples regarding how you might use the content of this section of the Manual in your practice. Affix extra paper for your Journaling entries to the end of this Manual. What four feelings do children of divorce tend to share, regardless of the level of interparental conflict? To select and enter your answer, go to the Answer Booklet.